Especially for groups and individuals arriving every Thursday - Friday. During this tour you will see the popular tourism attractions of Armenia in a short period of your stay in this ancient hospitable land. Tours are conducted in comfortable cars and buses with a guide. The tour included lunch in Sevan trout with barbeque, tasting the world famous Armenian cognac and a farewell dinner in the national traditional Armenian restaurant with "live" music and dancing and of course with the most delicious dishes and environmental. Arrival and meeting with the guide. Transfer to hotel. Sightseeing tour of the capital with visits to museums. Breakfast at the hotel. Yerevan is one of the oldest cities in the world 782 BC, extant. 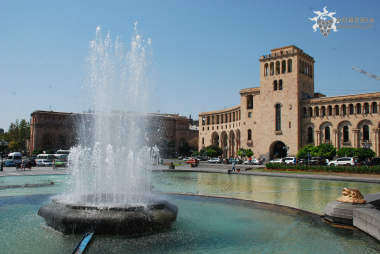 Yerevan today - a modern metropolis, political and cultural center of Armenia. It attracts more and more tourists for its architecture, hospitality, cozy cafes and restaurants, parks and streets. Undoubtedly majestic Ararat - the biblical Mount leaves a lasting impression and visible from almost all corners of the city. City tour with a visit to: Street Bagramyana, Republic Square, Park «Victory» and the unforgettable view of the city and the biblical Mount Ararat, Mashtots Avenue. Matenadaran - the repository of ancient manuscripts and manuskriptov-unique museum, which contains about 25,000 exhibits. Cascade - a complex of fountains and Museum. Gerard Cafesjian, Tsitsernakaberd - a museum and memorial dedicated to the Armenian Genocide in the Ottoman Empire in 1915., Sports and Concert Complex, Kiev Bridge, Residence of the President, and the National Academy of Parliament, Opera and Ballet Theatre. Lunch at the restaurant. Visiting Brandy Factory "Ararat" tour and tasting. The return to the hotel. Additionally, in the evening: You can enjoy the Armenian jazz. Jazz came to Armenia 70 years ago. In Yerevan, there are about 10 clubs, if you wish we can reserve a table for you. Breakfast at the hotel.This day we will start with a trip to Gurni. Garni Temple - an outstanding example of Hellenistic culture in Armenia. This place was the summer residence of Armenian kings over two thousand years ago. Temple and surrounding ruins are located within 28 km. to the north-east of Yerevan in the Kotayk region. Garni Fortress was built in the 3rd century BC on a triangular plateau that rises above the deep canyon, where rocky cliffs create a natural barricade on three sides. Being practically impregnable, it was one of the most legendary fortresses of ancient Armenia. 6 km. from the temple of Garni is amazing Geghard Monastery, known as one of the greatest of their spiritual and cultural centers of Armenia. The first name of the temple - Ayrivank or Pechersk Lavra.Gegard history dates back to pre-Christian times. The monastery was founded in the IV. on the site of a sacred spring, originating in the cave. Gegard known relics that had been stored in it. The most important of them - the spear that pierced the body of Jesus Christ on the cross. Lunch with cooking delicious Armenian bread. Next departure on Lake Sevan. 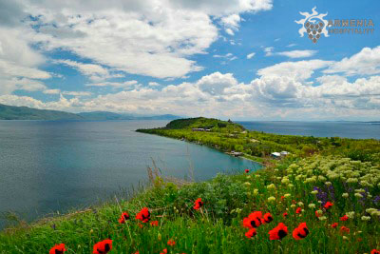 Sevan - Alpine lake in Armenia (situated at an altitude 1900m. ), The largest in the Caucasus. Lunch at Lake Sevan (skewers of Sevan trout). Visiting the monastery of Sevan peninsula, with a height which overlooks the beautiful view of the emerald - sparkling Sevan. A great opportunity to take pictures on the memory. Departure to Echmiadzin. Echmiadzin means "only begotten Son of the parish." This - the ancient capital of Armenia. According to legend, Jesus Christ came down from heaven and have a place to build a church. Cathedral of Holy Etchmiadzin was built on this site in the 4th century (301-303), at the dawn of the Christian conversion of the country. The cathedral was built over the pagan temple of Vagharshapat, after the king Tiridates destroy it.Armenia was the first country in the world to adopt Christianity as a state religion. 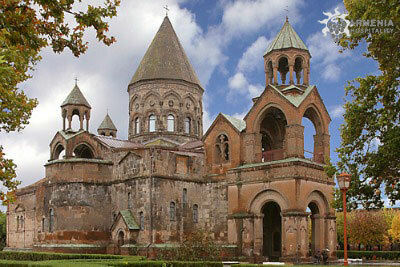 Echmiadzin is the residence of the Supreme Catholicos of all Armenians and the center of the Armenian Apostolic Church. On the way back visit Zvartnots temple. An architectural masterpiece "Zvartnots" was built in the period from 641 to 662 years. It was destroyed by an earthquake in the 10th century, it was discovered nearly a thousand years later, in 1900-1907gg . In 2000. excavations included in the UNESCO World Heritage List. Lunch. Visiting carpet factory "Megerian" - Armenian carpet weaving has century carpets only on a natural basis. Vernissage - craft fair in the open. Here you will find souvenirs, paintings of Armenian artists, folk instruments, carpets, rugs, handmade jewelry and other things that you can buy as a souvenir. Optional: To make your evening a memorable one, we can arrange a farewell dinner in a jazz club "MEZZO". Club "MEZZO" is the live music of different genres and styles each evening. We offer our guests a dinner accompanied by live piano music from 20:00 pm and from 21:30 every night on stage "MEZZO" serve our musical groups in different styles. We offer you the most unforgettable evening in Yerevan, accompanied by a variety of quality music - jazz, blues, rhythm and blues, rock, jazz-rock, Latin, ethnic, classical. The club has set the best sound and light equipment for the maintenance of the highest quality concert and enjoyment of our visitors. Kitchen "MEZZO" is open to the public from 12:00 to 01:00 am. Optional: We recommend not to miss concerts every Friday and Saturday in the hall of solemn events Arts Center "Cafesjian" - one of the favorite places of Yerevan, where you can listen to jazz, rock and pop music, as well as see a unique collection of Geghard Cafesjian. Concerts start at 20.00 Night in a hotel / or transfer to the airport.